Hello blog-folks. Will Richard here picking another favourite from the 68,000 options that make up the Grant Museum. And this time it’s a shocker. Literally. The electric eel (Electrophorus electricus) is a long, thin freshwater fish native to rivers and swamps in South America. They grow to about two metres long and can weigh up to 20 kilogrammes. Half of their name is true. They are definitely electric but despite their appearance they are not technically eels. Instead they are classified as knifefish though the confusion is understandable. Eels are long thin fish of the order Anguilliformes and (South American) knifefish are long thin fish in the order Gymnotiformes: a totally different kettle of long thin fish. Taxonomists noted that electric eels have no teeth, no dorsal fin and spawn in freshwater all of which deny them their “true eel” status. 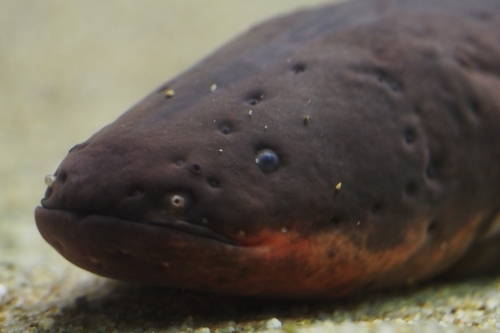 Electric eels are very serious about producing electricity. Approximately 80% of their body is devoted to the three specialised organs that do so with their “vital organs” crushed into the 20% behind their head. They have up to 6,000 electric-producing cells (electrocytes) arranged in lines that allow currents to flow. With a full discharge the eels can produce 860 volts for a two millisecond burst which, although rarely fatal to humans, is still very painful. It is more than enough, however, to deter all but the most determined predators and to incapacitate their prey. Adult eels feed on a wide variety of aquatic invertebrates, fish, amphibians, small mammals and birds which are often excellently camouflaged in the murky waters. While searching the eels release pulses of electricity at low voltages which cause their prey’s muscles to spasm. This uncontrollable jerking makes ripples in the water which the eels are sensitive to and so gives away even the best hiding place. Once they have located a meal the hungry eel will produce a much stronger electric pulse either stunning or outright killing the unfortunate animal. Electric eel. Image by Haplochromis; CC-BY-SA-3.0 via Wikimedia Commons. These fish have unusual mating habits. They lay their eggs in the dry season in clumps of a few thousand around which the male builds a nest of spit bubbles. He carefully hides and guards his bubble-wrapped offspring until the wet season comes. By this time the juveniles are about 10 centimetres long and more than able to take care of themselves. The heavy seasonal rains cause flash flooding which breaks up the family. The eel’s face. Image by harum.koh; CC-BY-SA-2.0 via Wikimedia Commons. I loved this article. It was interesting in its geographical information and its human interest. I’ve watched eels jump up the water fall where we like to go swimming in the summer. The are cool looking but still creep me out a bit. wonderful to see these amazing creatures. 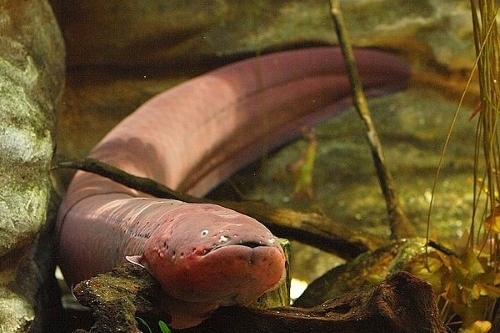 strange to think that we probably know more about dinosaurs than eels! i went to a great talk about them earlier in the year and discovered that they can travel across (wet) land to reach rivers when on migration.